A Chicago man was charged with arson last week for allegedly throwing a lit matchbook into a recycling bin in an El station before boarding his red line train. 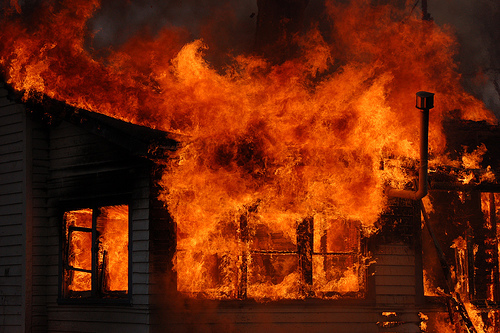 Under Illinois law a person commits arson if he knowingly damages another person’s personal property, if that property is valued at $150 or more. Arson is a specific intent crime, which means that the prosecution must prove that the defendant knew that his actions would cause a fire, or intended to do so. So “knowingly” is an important element of every arson charge. Without it, the prosecution has no case and the charges must be dropped or a not guilty verdict handed down in court. Whether any flammable material had been tossed into the recycling bin that would have caused the flames and damage from the fire to be more extensive than it would have been otherwise. A negative to answer to any of these questions would tend to cast doubt on the idea that the defendant knowingly set out to cause the fire. A second key element to arson is whether the value of the property damaged is $150 or more. The recycling bin itself was full of trash, and although the city may then sell the recycled material to scrap yards, this is not true personal property. And even if the court were to rule that it counts, depending on the extent of the damage it may be impossible to determine how much the city could have sold the material for, since it is now burned rubbish. Depending on the type of recycling bin, there may be minimal damage. A steel or metal bin may have gotten scorched but could likely still be used, so although damaged, there wouldn’t be the need to replace or repair it. If it was a plastic bin, the defense would need to determine the cost of the bin. Even if it could be proven that the property damage exceeded $150, the jury could be swayed into delivering a not guilty verdict because the property had no personal value to anybody – it was simply trash and a trash bin, not a vehicle or prized family possession. A conviction for felony arson carries with it the possibility of 3 to 7 years in prison. That’s why if you have been charged with arson you should contact a Chicago arson attorney as soon as possible. David L. Freidberg has close to two decades’ worth of experience handling arson and all other felony and misdemeanor crimes throughout Chicago, Skokie and DuPage County. He will thoroughly examine all of the evidence the police and prosecution have collected against you, and will use his team of forensic and investigative experts to find alternative explanations to help win an outright dismissal, acquittal or reduction in charges. Contact our office 24/7 at 312-560-7100 to schedule a free consultation.